This October marks the 23rd Anniversary of the Million Man March and Holy Day of Atonement. The mosque community as well as residents of the City of Detroit are very excited about the Honorable Minister Louis Farrakhan and Nation of Islam returning to the city of its founding. The historic event is expected to take place with weekend long activities starting on Friday, October 12 – Sunday, October 14. The keynote address by Min. Farrakhan will take place on Sunday, October 14. Pastor Maurice Hardwick greets members of NOI Executive Council. Key leaders in Detroit, community activists and organizers, clergy, civic leaders, entrepreneurs, educators, government officials, entertainers, Muhammad Mosque No. 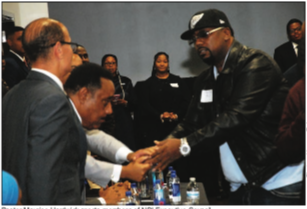 1 Believers and other hard-working residents attended a town hall planning meeting about the Holy Day of Atonement at the only Black-owned hotel in Detroit in the Roberts Riverwalk Hotel newly-renovated Grand Ballroom. It was a beautiful atmosphere with a view of the waterfront. The energy in the room was filled with excitement and anticipation of the discussion. Once the entire Nation of Islam Executive Council walked in the room to take their seats and start the Sept. meeting, the room filled to standing room only with approximately 300 people in attendance. Student Minister Troy Muhammad of Muhammad Mosque No. 1 in Detroit welcomed everyone. Student Min. Troy Muhammad and members of the leadership team made calls to invite the community to have a seat at the table of planning activities and to receive their blessing by helping the man of God. “The response of the city was the response based upon the love and the heart of the Honorable Minister Louis Farrakhan. It’s a response based upon the coming of Master Fard Muhammad in 1930 because so many Believers were affected by the coming of Master Fard Muhammad that you can’t identify a family that doesn’t have a Muslim member in the family, so we are already familiar with those teachings,” he explained. Though Chicago is the international headquarters of the Nation, and is where its flagship Mosque Maryam is located, Detroit is where the NOI was founded and established, July 4, 1930 with the appearance of the Great Mahdi Master Fard Muhammad. It was in Black Bottom Detroit where Master Fard Muhammad met, raised and cultivated thousands of Black men, women and children—among them, his top student, the Most Honorable Elijah Muhammad. Over the recent years, the Nation has hosted its annual Saviours’ Day Convention, commemorating the birth of Master Fard Muhammad in Detroit—the last gathering in the city coming in 2017. However, this is the first time the city will host the anniversary of the 1995 Million Man March called by God through Min. Farrakhan. “When one comes teaching those teachings, it resonates with the people here, the words of the Honorable Louis Farrakhan resonate with our people here in Detroit, there is no question that the people will come out based on his name. I’m appreciative that they came out and I thank the people of Detroit for attending this meeting on behalf of the Minister,” Student Min. Troy Muhammad continued. Min. Farrakhan gifted the City of Detroit with a special commemorative editions of the newspaper featuring the iconic Aretha Franklin, who called Detroit home. Ms. Franklin died Aug. 16. Stu. Minister Ishmael Muhammad, National Assistant for Min. Farrakhan introduced each NOI Executive Council member and shared very important words about the history of the Million Man March and why Detroit is a special, spiritual and important city as Mecca to the Muslim followers of the Hon. Elijah Muhammad. “It gives me great joy to come back home, personally, because it’s the city of my mother. And this is where we buried my mother,” he said, reflecting on his mother, Tynnetta Muhammad, wife of the Hon. Elijah Muhammad. “This is the city of my father, the Hon. Elijah Muhammad. So, I have roots here, and each time I come, to be honest, I start realizing more and more that I really am connected to Detroit even though I wasn’t raised here. But more than that, this city is such a sacred city, and it has so many great men and women in this city,” said Student Min. Ishmael Muhammad. A Message To Critics: Time Does Not Disqualify Survivors to Speak Out And Your Opinion Does Not Qualify You To Speak At All! Community United for Change in New Orleans helping victims of police brutality and corruption! History made: The confirmation of Sonia Sotomayor is official! Subscribe To Brother Jesse Blog for Exclusive Content, Social Media Strategies + more! My aim is to arm people with resources that will inform and inspire them to manifest the greatness that God has already placed within us all. I seek to empower people to not accept mediocrity, which is not tailor-made for the human being. We were born to conquer. 4 days ago Support Independent Education! #repost • @nurimuhammad ‪ My wife @terrimuhammad and I are running a 1/2 marathon on May 4, 2019. ‬ ‪We decided to dedicate this race to to our wonderful children of Muhammad University...‬ ‪ Would you be so kind to donate whatever you can and share this initiative with your friends and family? ‬ Link is in my bio. Thank you in advance! Copyright 2008-2019 - Brother Jesse Blog. All Right Reserved.